The International Transport Workers’ Federation (ITF) is a democratic, affiliate led federation recognised as the world’s leading transport authority. They fight to improve working lives, connecting trade unions from 147 countries that may otherwise be isolated and helping their members to secure rights, equality and justice. They are the voice for over 18 million members working men and women across the world. Poor service, incredibly lengthy call-out response times and ever increasing costs saw global union federation, ITF, at the end of its tether with its photocopy supplier. Head of Systems and ICT, Samantha A’Boe, reached out to Expense Reduction Analysts (ERA) for assistance. An in-depth project unearthed massive overcharges, which were subsequently refunded, and saw ITF transition to a new, better fit supplier with industry leading service levels and account management. The cost savings on the new contract were very much an added bonus! 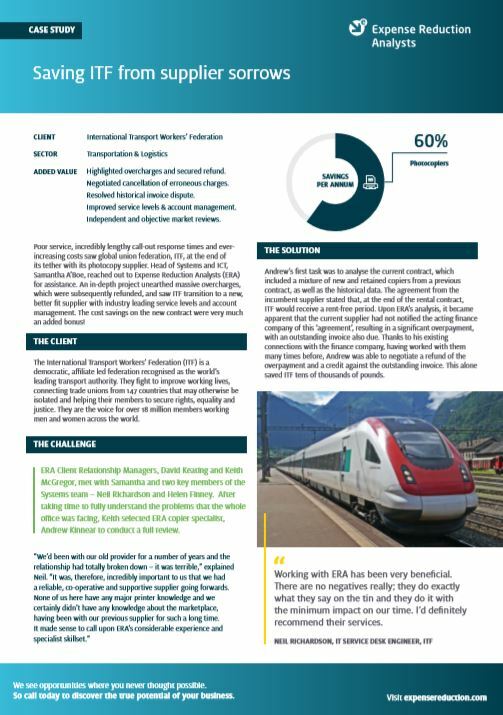 To find out exactly how ERA helped the International Transport Workers’ Federation, including specific cost saving examples, download the full case study today. Full details of exactly how Expense Reduction Analysts helped ITF can be found in our case study. Download the case study today. "Working with ERA has been very beneficial. There are no negatives really; they do exactly what they say on the tin and they do it with the minimum impact on our time. I’d definitely recommend their services." Interested in learning more about how ERA can help your organisation? Contact us today!